The academic year starts in April, so the Graduation ceremonies take place around the Spring solstice, March 22. Since the schoolyear worldwide is different, the use as kigo will differ from place to place. See the entries below for your area. The Japanese school year starts in April and ends in March, so there's a rush of graduation ceremonies from mid- to late March. 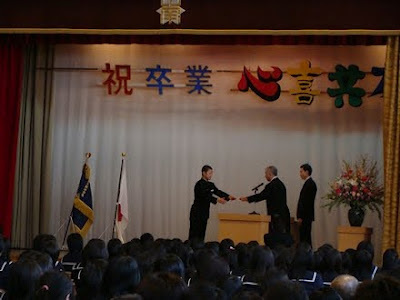 The ceremony consists basically of students receiving graduation certificates, but because it's the last event of the school year, it's conducted in a very solemn manner. The principal opens with an address, followed by speeches from invited guests. The certificates are then handed one by one to the students by the principal. It's an event in which everyone graduating is a hero or heroine. After the students receive their diplomas, all participants sing "Hotaru no hikari" (light of fireflies) together. Other songs may be performed, too, but "Hotaru" is sung at virtually all schools. The song's melody comes from the Scottish folk tune "Auld Lang Syne," with lyrics in Japanese. The Ministry of Education approved the song for singing in schools back in 1881; today it's performed not just at graduations but any time people must part. About 89,200 students graduated from public middle schools in Tokyo in March 1998, some 3,000 fewer than the year before. The figures are in keeping with the trend for families to have fewer children. According to a survey by the Ministry of Education and Science, this spring's graduation ceremonies' enforcement rate of singing "Kimigayo" (the Japanese national anthem) crept ever closer to their target of 100%. The school year begings after the summer holidays, usually sometime in August. The final days of school are therefore in June/July, varying by the state and every year. most universities celebrate for the day, the students roam the city in their colourful gowns and get their pictures taken, lots of parties are held, and the ceremonies get reported on the prime evening news. A lovely time, when many a proud family gives thanks after years of work and encouragement for the happy child!
. Graduation in Kenya .
. School exams KCSE / KCPE . The big hall of our grammar school is usually sub-zero during the ceremony, when we have to sit straight and motionless, listening a last time to the six-graders reciting grouptalk. It is an endearing ceremony in a village school with only 24 students and getting less every year... On the way out we shake hands for the last time with the little ones, before they enter the BIG school down the valley in the city.
. Graduation Ceremony in Kenya .